24, 2016, the White House will review it and respond! NEWYORK . FOR TERRESTAR CORPORATION . PUMP AND DUMP CONSTRUCTIVE FRAUD ..
GOD IS NOT DEAD !!! The net benefits to consumers that arise from implementing an SDL at 1.4 GHz including faster download speeds in urban and suburban areas, support for a greater number of users and better in-building coverage16. Our estimates show that the harmonisation and use of 1.4 GHz for a supplemental downlink for enhanced mobile multimedia and broadband services could generate economic benefits worth as much as €54 billion for Europe17. These estimates may be on the conservative side given that we have modelled only the impacts of a low projection of demand for mobile data. Modelling the impacts of a high demand projection would produce higher values for the benefits. There are three additional major benefits from the use of an SDL at 1.4 GHz. The 1.4 GHz band: ? Supports delivery of the Digital Agenda target to provide 30 Mbps access to 100% of the EU by 2020. This is an extremely challenging target for the market to deliver. Wireless has a key role in providing high speed broadband to remote and rural customers. The 1.4 GHz band can play an important role in providing very high speed broadband access required before 2020 to meet Digital Agenda targets and reduce the requirement for public subsidies. ? Increases competition in the mobile broadband and content markets. Limited availability of spectrum below 1GHz means that in many countries, operators will have little18 or possibly even no low frequency spectrum to provide mobile broadband services. The availability of additional spectrum at 1.4 GHz for an SDL will enable players to compete more aggressively in the supply of high speed mobile broadband and multimedia content. Increased competition is likely to result in lower prices for consumers. It is also likely to result in more mobile broadband capacity to experiment new business models. ? Gives European suppliers an early opportunity in the development of innovative mobile multimedia services and new mobile broadband business models utilising an SDL. There is considerable scope for the adoption of 1.4 GHz for an SDL outside Europe such as in the Middle East and Africa, Australia, Canada and Mexico. Implementation of the standard in Europe will open up new business opportunities in international markets19, particularly for service and content providers with successful business models. What regulatory changes are required? High levels of broadband penetration stimulate economic growth by providing connectivity to the internet. For example, access to the broadband internet ? Increases productivity by allowing more efficient solutions to business processes, better supply chain management and more efficient delivery of existing services ? Stimulates innovation and the development of new services and applications ? Improves access to information. The internet has certainly transformed the way information is accessed and stored, which enables improvements at all stages in the value chains of the economies of the MENA countries ? Enables restructuring of value chains, changing what services are offered and to whom they are offered. Broadband is widely recognised by many governments as enabling job creation. Jobs are created through direct employment in the network construction and telecoms equipment manufacturing, but more importantly through enhancing productivity and innovation in all sectors of the economy. A recent study in the US found that a one-billion dollar investment in wireless infrastructure a year would create approximately 12,000 jobs in that year21. The net present value of the benefits using 1.4 GHz for a supplemental downlink for mobile broadband in MENA region is estimated to be US$26 billion. The results are presented in Table 5-2: . The quantified benefits of 1.4 GHz translates into $1.94/MHz/pop which is around half the European value of $3.90/MHz/pop (€2.71) calculated in our study for Europe. Broadband Internet also facilitates the development of new financial services such as m-banking and online payments. These provide increased access to financial services for many people in low income countries where such services are often scarce and conventional transactions are costly. In Latin America, a study by Fundacion Telefonica found that increased access to financial services can help reduce social inequality and alleviate poverty22. For businesses and governments such services also help boost efficiency by lowering costs of doing business while creating more secure and reliable means of conducting transactions. As the examples above illustrate there are substantial economic benefits associated with broadband Internet. Plum’s recent study on the benefits of spectrum for mobile broadband in Sub-Saharan Africa highlights the importance of mobile broadband for economic development. We estimated that the release of digital dividend and 2.6 GHz spectrum in 2015 could increase overall GDP by $82 billion by 2025, potentially adding up to 27 million jobs and lifting 40 million people out of poverty23. A number of governments in MENA countries have launched initiatives to stimulate investment in broadband networks and improve access to broadband. For instance Egypt’s National Telecom Regulatory Authority announced a new national broadband plan ‘eMisr’24 in 2011 which included targets for mobile coverage (98% 3G coverage by 2015 and 90% 4G/LTE coverage by 2021) and for mobile penetration (8 million mobile broadband subscribers by 2015 and 14 million by 2021). It is estimated that achieving 2015 targets will create 6,650 to 17,500 direct jobs on average per year, and will result in an incremental cumulative contribution to GDP of US$ 4.17 billion. Qatar’s National ICT Plan25 set out the following goals: to double the ICT sector’s contribution to GDP (to US$ 3 billion) and double the ICT workforce (to 40,000). This would involve providing high-speed broadband access to 95% of households and businesses, and achieving 90% Internet adoption. For Morocco, the key priorities under its ‘Maroc Numeric 2013’26 strategy are to encourage investment in ICT, increase Internet penetration, develop domestic IT sector and facilitate e-government provision. The plan is expected to generate an additional US$3 billion in GDP and create 26,000 new jobs by 201327. As well as promoting economic development, broadband Internet access stimulates social development by substantially improving the delivery of social services such as health care and education. This is especially true of rural areas in middle income countries like Algeria, Egypt, Morocco and Jordan. The 1.4 GHz band offers 40 MHz of downlink capacity that could help to alleviate the spectrum shortfall identified in the study countries. A 1.4 GHz SDL is especially useful for mobile broadband because mobile data traffic is already highly asymmetric with much more data in the downlink than the uplink as shown in Figure 4-1. 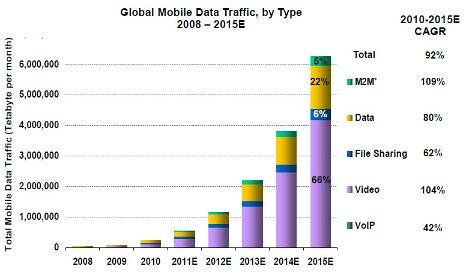 Moreover this asymmetry is growing as the video proportion of mobile data traffic grows. Using forecasts of the mix of traffic produced by Allot and Cisco we have estimated that the current ratio of downlink to uplink traffic is around 6:1 and that this could rise to 10:1 over the next five years54. The ratio between downlink to uplink capacity is around 2:1, which implies a significant imbalance between the downlink to uplink traffic ratio and the downlink to uplink capacity ratio when relying solely on paired spectrum. A supplemental downlink provides only downlink capacity and would therefore help meet the growing demand for downlink traffic. 54 Economic study of the benefits from use of 1452-1492 MHz for a supplemental downlink for enhanced multimedia and broadband services, Plum for Ericsson and Qualcomm, June 2011. http://www.plumconsulting.co.uk/pdfs/Plum_June2011_Benefits_of_1.4GHz_spectrum_for_multimedia_services.pdf ; 55 The data is based on measurements in live networks. Median value is shown. Supplemental downlink and carrier aggregation capability is now enabled in the HSPA+ and LTE- Advanced standards56. Implementation of a supplemental downlink in actual networks has not yet occurred. However, in the US AT&T plans to implement the supplemental downlink technology in its LTE network using spectrum at 700 MHz, coupled with paired AWS spectrum which AT&T already holds57. In Europe, ECC Report 18858 conducted an impact assessment of the future harmonised use of the 1.4GHz band59 and concluded that a mobile broadband SDL would generate the highest economic and social benefits of the candidate applications for the band. In September 2012 CEPT started the regulatory work to harmonise the 1.4 GHz band for a SDL60. An ECC Decision including the technical rules for harmonised use of the band is expected by September 2013. It is therefore possible that we will see harmonised use of the 1.4 GHz band for a mobile SDL across European countries partially from 2013 and fully from 2015. In France, Orange will conduct an SDL trial in partnership with Ericsson and Qualcomm in early 201361. A possible implementation timetable is shown in Figure 4-2. This would mean that equipment would be available for use in the MENA region by 2015. (SHL) and Terrestar Networks Inc., CASE # 10-15446(SHL). to be tried in the Southern District Court of New York to begin with. Enforcement Agencies .Or will it be swept under the rug! of this fraud as well. or any physical office in the State of New York or at New York City. Terrestar Corporation once owned 58% of Skyterra Communications Inc.
valuated the exact spectrum for a whopping $8.9 Billion Dollars. abuses and these violations.They simply “ COOKED THE BOOKS “ ! and as well of Terrestar Corporation . we thank you again Judge Chapman. WE APPEALED ALL OF IT DUE TO ILLEGAL AND CRIMINAL ACTIVITIES: http://terrestarcorprestructuring.com/pdflib/691_10612.pdf . TerreStar Corporation, which filed for voluntary chapter 11 protection on February 16, 2011, holds 64 government licenses of 8 MHz of nationwide terrestrial spectrum in the 1.4 GHz band, covering more than 312 million people (the so called "1.4 Spectrum") to use the spectrum for high-speed data, or so-called 4G, networks. When adopting its service rules for these bands, the FCC established a flexible regulatory and licensing framework in order to promote the provision of new and technologically innovative services. Licensees may provide both fixed and mobile services including wireless internet, high speed data as well as advanced two-way mobile and paging services. These assets including TSC's equity interest in Terrestar Holdings Inc. ("TS Holdings") are now for sale. Company, assuming successful implementation of the proposed business plans. these values to the amount paid by the Company per MHz POP in the Transactions. STOCKHOLDERS AGREEMENT DRAWN UP ! "STOCKHOLDERS AGREEMENT, dated as of [? ], 2012 (this "Agreement"), by and among TerreStar Corporation, a Delaware corporation (the "Company"), Solus Alternative Asset Management, LP, on behalf of itself and its affiliated and managed funds, (the "Solus Stockholder"), West Face Long Term Opportunities Global Master L.P., on behalf of itself and its affiliated and managed funds, (the "West Face Stockholder"), Highland Capital Management, L.P., on behalf of itself and its affiliated and managed funds, (the "Highland Stockholder"), and each other holder of the Company Common Stock (as defined below) signatory hereto (collectively, together with the Solus Stockholder, the West Face Stockholder and the Highland Stockholder, the "Stockholders" and, each individually, a "Stockholder"). Terrestar withdraws the offering of new shares ! "The Applicants submit this request for withdrawal as they do not intend to pursue the contemplated offering of securities under an indenture required to be qualified under the TIA. The Applicants confirm that no securities have been or will be distributed, issued or sold pursuant to the Form T-3 and that the Form T-3 has not been declared effective by the Commission"
1.4 GHz equipment developed and ready to be deployed ! 1.4 GHz Pico Base stations, Micro Base sations, Macro Base stations, Mimax Pro, Mobile Radio Terminals and Embedded modules now available. Check out the new AirSynergy units ! BEACHFRONT SPECTRUM FOR SALE !!! 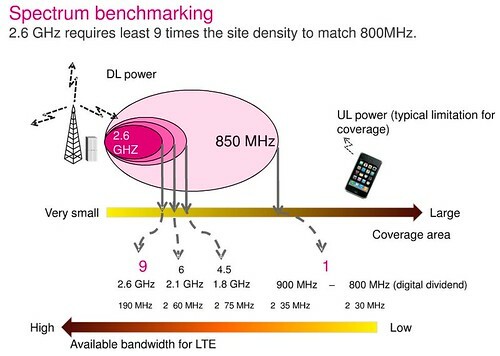 "The 1.4 spectrum can be used for LTE applications"
"87% of the population can be served with LTE pico-cell"
"The 1.4 GHz band is ideal for mobile applications"
"It is easy to add it as an additional channel to existing Base Stations"
"The available 1.4 GHz spectrum would increase the bandwith of an existing 10 MHz Base station by 30%"
"The Terrestar band supports terminals with high power levels which reduce infrastructure costs"
"A 3-MHz LTE cell would be able to serve millions of customers"
On the 5th and 6th of September 2012 TerreStar Corporation put notices in the Washington Post and the USA daily to notice the sale options. 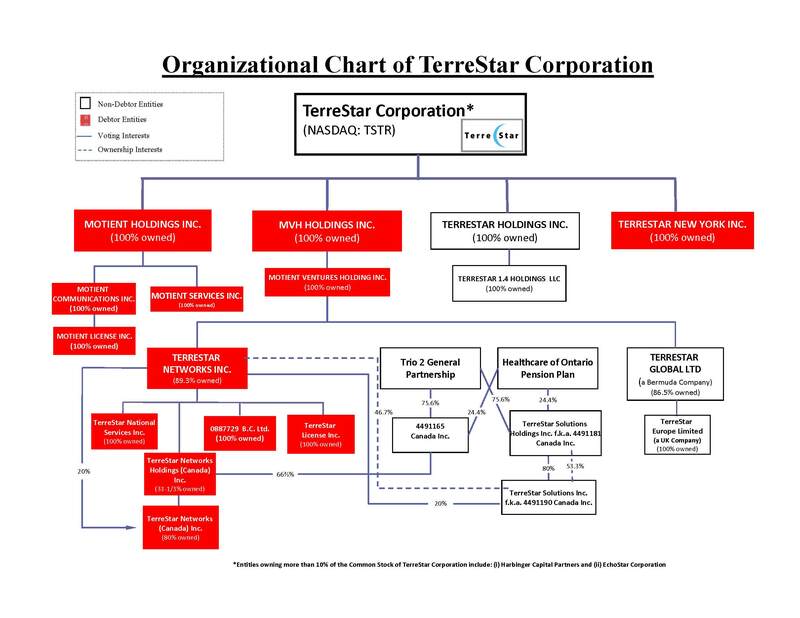 TerreStar Corporation, is the controlling shareholder of TerreStar Networks Inc. and TerreStar Global Ltd., and a shareholder of SkyTerra Communications. TerreStar is based in Reston, VA, and plans to build, own and operate North America's first next generation integrated mobile satellite and terrestrial communications network that will provide universal access and tailored applications throughout North America over conventional commercial wireless devices. With a first-to-market launch strategy in 2008, TerreStar expects to offer customer-designed products and applications over a fully optimized 4G IP network. For more information on TerreStar Networks visit www.terrestar.com. RESTON, Va. and PALO ALTO, Calif., May 18, 2009 /PRNewswire via COMTEX/ -- TerreStar Networks, a majority owned subsidiary of TerreStar Corporation (Nasdaq: TSTRQ), and Space Systems/Loral, the leading provider of commercial satellites today, announced that TerreStar-1 has arrived on schedule in Kourou, French Guiana where it is scheduled to launch on June 24th aboard the Ariane 5 heavy lift launch vehicle. TerreStar-1 will be the largest commercial satellite ever launched and is designed to provide integrated satellite and terrestrial mobile services for critical communications using conventionally-sized dual mode handsets. "The arrival of TerreStar-1 signals the start of final launch preparations," said Jeffrey Epstein, President of TerreStar Networks. "Once launched, TerreStar-1 will allow us to deliver on the vision of an integrated satellite and terrestrial mobile service that enables next generation applications anytime, anywhere." Dennis Matheson, TerreStar Networks Chief Technology Officer said, "The design, manufacture and delivery of TerreStar-1 has been a team effort. We have relied on our colleagues at Space Systems/Loral for their experience and support in delivering the integrated satellite and ground system that makes our new services possible. We now look forward to a flawless launch by our partner Arianespace." "It has been a pleasure working with TerreStar Networks on this challenging project," said John Celli, President and Chief Operating Officer at Space Systems/Loral. "With its 18-meter unfurlable reflector and extraordinarily powerful S-Band feed array, TerreStar-1 was designed to provide next generation capability for mobile devices." Ideally suited to provide critical services to government, emergency responders, rural communities and commercial users, the satellite uses 2 GHz spectrum to provide voice, data and video communications to satellite/terrestrial mobile devices the size of a typical smart phone. Space Systems/Loral, working with Hughes Network Systems, has developed a two-way ground based beam forming technology that enables the satellite to reallocate resources based on demand, thereby maximizing capacity. TerreStar-1 is based on SS/L's 1300 space-proven platform, which provides the flexibility to support a broad range of applications and technology advances. The satellite will be capable of generating over five hundred spot beams covering the Continental U.S., Canada, Alaska, Hawaii, Puerto Rico and the U.S. Virgin Islands. TerreStar Networks (www.terrestar.com), a majority owned subsidiary of TerreStar Corporation (TSTRQ), plans to offer a reliable and secure satellite terrestrial mobile broadband network that will provide voice, data and video services dedicated to helping solve the critical communication and business continuity challenges faced by government, emergency responders, enterprise businesses and rural communities. TerreStar expects to offer next generation mobile communications through a network of partners and service providers to users who need "anywhere" coverage throughout the United States and Canada. This document contains forward-looking statements within the meaning of the U.S. Private Securities Litigation Reform Act of 1995. When used in this press release, the words "believes," "expects," "plans," "may," "will," "would," "could," "should," "anticipates," "estimates," "project," "intend" or "outlook" or other variations of these words or other similar expressions are intended to identify forward-looking statements and information. In addition, Loral Space & Communications Inc., Space Systems/Loral, Inc. or their representatives have made or may make forward-looking statements, orally or in writing, which may be included in, but are not limited to, various filings made from time to time with the Securities and Exchange Commission, and press releases or oral statements made with the approval of an authorized executive officer of the company. Actual results may differ materially from anticipated results as a result of certain risks and uncertainties which are described as "Risk Factors" and in the "Commitments and Contingencies" note to the financial statements in Loral's most recent annual report on Form 10-K and subsequent reports on Form 10-Q. The reader is specifically referred to these documents, as well as the company's other filings with the Securities and Exchange Commission. Risks and uncertainties include but are not limited to (1) risks associated with financial factors, including the global economic downturn, our history of losses and financial covenants in SS/L's credit agreement; (2) risks associated with satellite manufacturing, including competition, contractual risks, creditworthiness of customers, performance of suppliers and management of our factory and personnel; (3) regulatory risks, such as the effect of U.S. export control and economic sanction laws; and (4) other risks, including litigation. The foregoing list of important factors is not exclusive. Furthermore, Loral and SS/L operate in an industry sector where securities values may be volatile and may be influenced by economic and other factors beyond the control of Loral and SS/L. Representatives for TerreStar and Dish declined to comment. Copyright (c) 2011 Dow Jones & Company, Inc.
CCTV Wireless, Inc., to TerreStar License Inc., ULS File No. (rel. Dec. 24, 2008) (consummation of the assignment). deployments in dense urban areas. essential that the Commission expand this band to 10 megahertz. No. 0215-EX-PL-2014 (March 14, 2014). NOAA for sensitive high-speed data links with the GOES-R spacecraft. GOES-R system. 10 See AWS-3 NPRM. exposed.. in t.v. and in court .. This study, commissioned by Ericsson and Qualcomm, provides an independent assessment of the economic benefits which would arise from using 1.4 GHz spectrum (at 1452 to 1492 MHz)15 to provide a supplemental downlink (SDL) for mobile broadband services in the Middle East and North Africa (MENA). Mobile broadband traffic in the MENA region is forecast to grow rapidly over the next 10 years. It is possible there will be a shortage of spectrum to support this traffic growth unless additional measures are taken. Notably the 1.4 GHz frequency range is largely unused in much of the MENA region. It could be used to combat any shortage by providing additional downlink capacity to mobile broadband services. This could: ? Increase mobile broadband network capacity at a lower cost than building additional infrastructure ? Reduce the cost of providing coverage in rural areas and in buildings in urban areas ? Offer better service quality, through higher data rates and faster downloads as a result of the additional capacity and coverage provided. The purpose of this report is to provide evidence on the nature and scale of these benefits so as to help inform decisions about the future use of the 1.4 GHz band in the MENA region. 1.2 How does a supplemental downlink work? A network implementing a SDL uses a wider channel for the downlink than for the uplink, by aggregating the usual downlink with a supplemental downlink channel. Using an additional downlink channel enables faster download speeds for mobile or portable wireless devices and support for a greater number of users, as shown in Figure 1-1. 15 This frequency range is sometimes referred to as L band. Figure 1-1: Results of simulation of performance of a HSPA+R9 supplemental downlink (SDL) network for bursty applications. 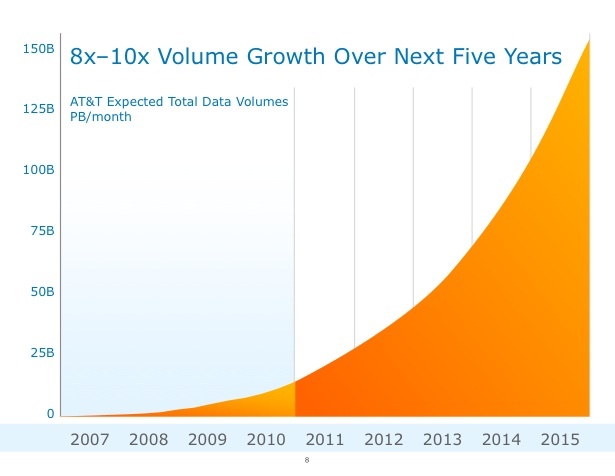 This approach requires new technology sometimes termed carrier aggregation technology. The technology allows the bonding of spectrum in different bands into a single wider downlink channel Figure 1-216 illustrates. This provides an efficient way of using spectrum because consumption of video and other data heavy applications over mobile broadband networks is asymmetric – there is much more traffic on the downlink than on the uplink. Figure 1-2: A typical supplemental downlink configuration. 16 Example of HSPA+ R10 with a 3 + 1 inter-band downlink carrier combination. In this report we assess the economic and social benefits of deploying a 1.4 GHz SDL in the seven MENA countries indicated in Figure 1-3. The results for these countries are then extrapolated to the region. These income differences are reflected in similar differences in the adoption and use of telecommunications services. The countries also vary considerably in terms of population size and population density both of which have a bearing on our assessment of the economic value of an SDL at 1.4 GHz.